Home • Europe • Portugal • '08 Apr: Évora, Portugal Click HERE and all the pictures will get big. Évora, Portugal: here come pictures from the last two nights... starring my old pal from The Berkeley Years, Alberto Rosa. I don't remember having seen him since, and here's his Mama, Aldegice. ...where at each we met some people and drank an aperitif. It was 11 o'clock in the morning. Alberto told me a long and extensively entirely utterly complete story of this place, but I can't find it in the guidebook or on the internet, and you know, I forget, so I'm going to have to search around more to be reminded of the details. Walking to the car, this guy is for real, so Portugal, just lolling in his window watching the afternoon go by. There is a Rails-To-Trails project here in Évora much like the ones in the US. This is an easy 2 minute walk from the house. It's real country out here. You'll see pictures of goats, and sheep live next door, and there are acres of grape vines at every turn. Aldegice designed this house with an architect about 28-30 years ago when electricity was not yet in the area and there were no other houses around. Past the tree is the entrance she uses when Alberto is staying. Olive tree groves are also a prominent feature of the landscape. With all the olive trees, grape vines, rolling hills, and fruit trees, it feels very familiar. A stroll up the track from the house, note the big mossy rocks - one of Alberto's favorite sitting spots. In Évora, a UNESCO World Heritage city, this is part of the 14th century city walls that still surround much of the old city. Évora has had it’s eras of great prosperity and eras of decline. Another view of the house, and an entrance to the largest of the three kitchens. In one of the enclosed patios. Originally there were many separate buildings around a central courtyard and breezeways between them but Aldegice closed in the breezeways about ten years ago to make it easier to use the house in bad weather. These patio-rooms are so lovely with tile floors and floor to ceiling windows looking one side into the courtyard and one side out to the country. A dead car battery and the guy who helped get us going. That’s the house in the background. More to another side of the property – lounging and grape vines. This woman was at one of the taverns and is a longtime acquaintance of the family. ‘Take my picture!’ she instructed. She was not pleased with the first one and so struck the second pose with which she was then quite delighted. I rather like them both. And Alberto’s frequent instruction: ‘Take my picture!’ - one small example of what a rarity this visit has been! The woman standing next to Alberto has been working for his mom for a couple decades now, doing household chores, and that's the helper's mama sitting on the bench. They were very lovely and kind. One of the wineries we visited. And this is another one. The tourist office promotes a Wine Route with self-drive maps and guided tours. It's big. We came back with a carload of wine. Next stop: a friend's home. This is a clip from their garden, where we visited for a while and drank red champagne. Alberto had to watch a soccer game at his favorite football tavern... I decided to go for a little look-around so I got dropped off at the walls of the city and I wandered about for a couple hours. Templo Romano: dating from the 2nd or 3rd century ‘the best preserved Roman monument in Portugal…commonly referred to as The Temple of Diana…how did it manage to survive in such good shape for some 18 centuries? The Cathedral, begun in the late 1100s and completed around sixty years later. Like the Cathedral in Lisbon, we’ve got our Pillars of the Earth style of columns, walls, and ceiling. On the way home we visited The Goat Man and bought some wonderful cheese. That section in the bigger box is one day's production. What a treat! Goats! There were acres for them to graze in and it didn't smell icky at all although it was prudent to watch your step. A tavern stop! Check out the notice of a poetry reading by Alberto Rosa Poet Extraordinaire. He made the posters, put them around town, and did this reading in front of the Public Library the weekend before I came. Alberto said he read many of the poems in English and the attendees mostly did a lot of drop-jawed staring. Next morning we're off to visit the grave of Alberto's father. ...past which you can walk to the historic cemetery on the walls of the city. The last photo of Alberto and his dad together. 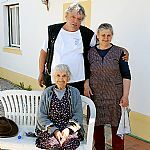 Aldegice has a second dwelling on the property where she is letting a Moldavian family live while they get settled in Portugal. They seem very sweet and good people to have around when you're 83 and live alone in the countryside. It was the Orthodox Easter Sunday! 'The Moldavians', as the family is known, brought over a feast for everyone to enjoy. What an unexpected and delightful end to my visit here!